At The Grand Apartments we have 24 hour check in service so there is no need to worry about getting here within office hours. If arriving by vehicle the best access is via: 24 Labrador Street, LABRADOR. Proceed up the ramp where you will find RECEPTION. There is parking available whilst you are checking in. On the left hand wall when facing the Reception doors there is an Intercom, press ‘100’ and then the red ‘Key’ button. This will ring our after hours service. 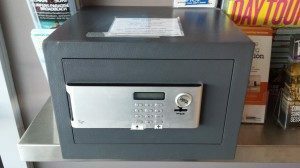 Once they have confirmed your booking, they will open the Reception door and advise you of the code for the Key Safe which is located inside the reception area on the left wall as you walk in. To use the safe, firstly press the ‘enter’ button, then enter the code you have been given (4 digits) and then press the ‘green key’ button. The safe will open automatically. Inside the safe there will be an envelope with your name on it with details of your allocated apartment, car space number, key to your apartment and a security fob to enable you to access the basement car park and lifts. If a shuttle bus drops you at Level 1 (same level as The Grand Hotel), please follow the instructions on the intercom. Our after hours service will release the glass entry door and lift so that you can proceed to our Level 2 Reception area. The key safe is located near the reception doors. Please register with reception the following morning. An additional key can then be provided once registration has been completed.